FRANKLIN -- When the Massachusetts town named after him asked Benjamin Franklin to donate a bell for the municipal meeting hall, the famous patriot, scholar, and inventor promised to send a gift of books instead. ''Sense," he wrote to the town fathers, was ''preferable to sound." Given to the town in the 1780s, those 116 books -- titles ranging from ''A Pilgrim's Progress" to treatises on religion and history -- would become the seeds for one of the first public libraries in the nation. 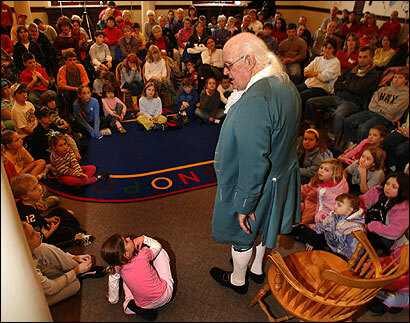 Yesterday, it was apparent that Franklin's curiosity and love of learning also survived the centuries, more than 150 people crowded into the town library to celebrate his birth 300 years ago to the family of a modest Boston soap-maker. Franklin impersonator Bill Meikle held court in a green Colonial suit and leggings, britches and a lacy jabot, or neckpiece. ''This is my 300th birthday, God save me," said Meikle, 70, who jabbed at children with his knobby cane as he spoke about Franklin's life. Meikle, in character, filled in details about Franklin's inventions (which included the glass armonica, an ethereal-sounding music instrument, and bifocal glasses), about whether or not he supported slavery (he had slaves at one time but later became an abolitionist), and about his relationship with his wife, Deborah (she was illiterate when they married, but he taught her to read, write and do simple mathematics). Festivities in the town of 30,000 will also include a visit by Lieutenant Governor Kerry Healey to the Benjamin Franklin Classical Charter Public School and a recital on the glass armonica on Friday. ''It's impressive to see what they're doing," said Robert Allison, a Suffolk University history professor who spoke about Franklin's life yesterday. ''Three hundred years after his birth, and 220 years after his donation of books . . . and it just shows that [Franklin's] legacy is one that continues." Celebrations in Boston, where Franklin was born in 1706, this month include events at the Museum of Science and at the Benjamin Franklin Institute of Technology, which was founded by a bequest in Franklin's will. Franklin's adopted home of Philadelphia, meanwhile is throwing a yearlong party that includes an 8,000-square-foot exhibition that will be shown in the city through April. It will then travel to St. Louis, Houston, Denver, Atlanta, and Paris, where Franklin was an early American representative. For many, Franklin embodies that very American characteristic of having pulled himself up by his bootstraps. He also ''symbolizes knowledge, the value of education, the importance of maintaining institutions like libraries," said US Representative James McGovern, who introduced Meikle. ''Massachusetts' greatest strength is our intellectual capability -- our schools and our universities and our colleges, and I believe that's very much in the spirit of Ben Franklin," he said. Eamon McCarthy Earls, a sixth-grader at the Ben Franklin charter school, was eager on Saturday to rattle off Franklin facts -- that was the postmaster general, an ambassador, and was involved in early fire departments. And even more importantly, according to the lanky 11-year-old, Franklin was a big advocate of public service -- something he says is stressed at his own school. Students there will be raising funds for the Benjamin Franklin High School in New Orleans, which was closed due to last fall's hurricanes and is slated to reopen as a charter school on Franklin's birthday, Jan. 17. For Deborah Pellegri, town clerk in Franklin for 21 years, it's a chance to celebrate a Massachusetts native who is renowned worldwide. ''We're so proud of Ben Franklin being our namesake," she said.